Homecoming at San Diego State University is an annual celebratory tradition. Students, faculty, staff, alumni, friends, and family gather to commemorate the outstanding achievements made by SDSU student leaders. Through recognition of the Royal Court, San Diego State University honors those exceptional individuals who have shown their dedication through extraordinary commitment to leaving a legacy of pride. The Royal Court selection process begins with an nomination submission, which is completed by the the nominating student organization. Then nominated student leaders who meet the minimum requirements will be invited to complete the Homecoming Court Candidate Application. Ten Royal Court members are chosen based on leadership, spirit, integrity, and achievement through their contributions and involvement at San Diego State University. The Ten Royal Court members are announced at the Homecoming Royal Court Announcement party on September 26th at 12:00 pm in the Conrad Prebys Aztec Student Union Goldberg Courtyard. Then the ten Royal Court Members are invited to complete interviews, conducted by SDSU faculty, staff, and alumni. The selection of the final two Royals is based on the evaluation of the applications and interviews. The week prior to the Homecoming football game, the Royal Court members volunteer at an Aztec Unity Project and attend the time-honored annual Homecoming Brunch the day of the game. The announcement of the two Homecoming Royals takes place at the SDSU Homecoming football game on Saturday, October 20, 2018. Candidates can be nominated by one Recognized Student Organization, Associated Students Council, Honors Council, or fraternity, sorority or Greek auxiliary. Candidate must be an active, unpaid member of the nominating organization. Undergraduate Student Candidates must have completed at least 60 units by the time of nomination. Graduate Student Candidates must have completed 75 units at SDSU by the time of nomination. 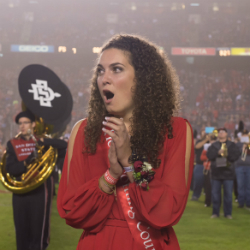 Only SDSU students who have not been selected to the court in prior years are eligible for candidacy to the 2018 SDSU Homecoming Court. The ten Royal Court members will be announced on September 26th at 12:00pm in the Conrad Prebys Aztec Student Union Goldberg Courtyard. 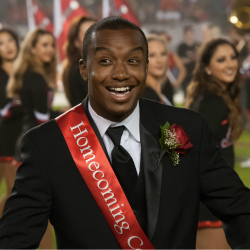 Contact Student Life & Leadership at (619) 594-5221 or email homecomingcourt@sdsu.edu. 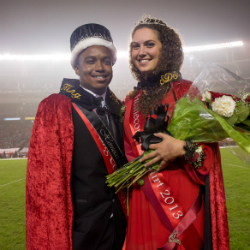 Were you on an Aztec Homecoming Court? SDSU Student Life and Leadership is planning an event for Homecoming Week to include all alumni who were members of an Aztec homecoming court. If you were a homecoming court member prior to 2001, please email Jen Ranallo at jranallo@sdsu.edu. Please include your contact information, graduation year and the year you participated in the homecoming court. Also, please list the names of other homecoming court alumni you may know or forward this information to them.